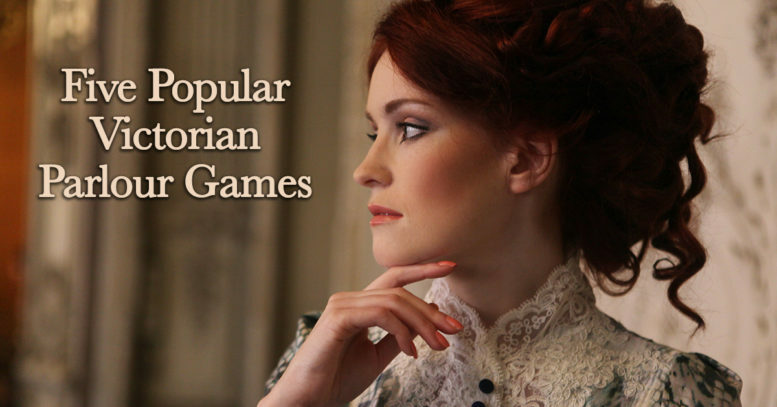 Parlour games were incredibly popular during the Victorian era, as I’m sure Sir and Lady Gilbert would attest! They were played primarily by the middle and upper classes, as a means to entertain dinner party guests and small family gatherings. Parlour games were designed for indoor entertainment and were primarily played in the parlour; hence the name ‘parlour game’. They consisted of either logic or word-play primarily, although some did involve additional equipment – although this was restricted to what was typically found in a Victorian parlour. Still a firm favourite, charades involves having two or more teams act out prepared phrases for their team to correctly identify. Popular phrases, song, play or book titles are written on pieces of paper and placed in a hat, prior to the game commencing. Each team then takes turns in choosing a piece of paper and acting out what’s written. One person is blindfolded whilst the other guests scatter around the room. The aim is for the blindfolded person to a) find another guest and b), accurately identify them. If they’re correctly identified, that person takes over the blindfolded role and the game continues. A person is nominated to be ‘judge’ and they leave the room. All other players place a small personal item into a box. When the judge enters the room, they have to pick an item and describe it. The owner of that item then identifies themselves, before performing a forfeit of the judge’s choosing, to earn back their item. Typical forfeits would be amusing or embarrassing, such as sing a song, make someone laugh, tell something embarrassing that happened to them etc. If they refuse the forfeit, the judge keeps the item. With this game, all players form a circle and the first player states ‘I have a basket’. The next person then asks what’s in the basket. The person next to them has to then name something beginning with the letter A. Play then continues to the next person, who has to name something beginning with the letter B, and so on around the group and through the alphabet. A person has to leave the game if they cannot think of a word that begins with the letter they have. One person stands in the middle with their eyes closed, whilst the other players form a circle around them. A slipper is then passed from player to player, behind their backs – and must stop passing it, immediately upon the centre player opening their eyes. This player must then guess who’s holding the slipper. If they guess correctly, that person swaps places and becomes the middle player. If they guess incorrectly, they have to close their eyes and play commences.